Tomorrow evening we begin our transit of the Panama Canal. We've been thinking about this for months and now it's here. We pick up our Transit Advisor around 5pm -- although we expect him to be late; it seems to be the norm. 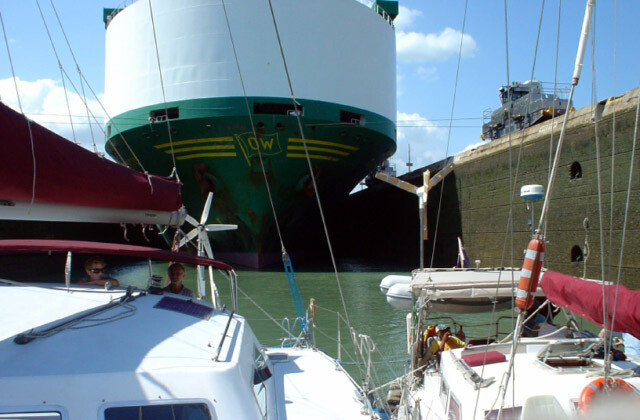 We'll pass through Gatun Locks in the dark and tie up in Gatun Lake for the night. Early Thursday we'll set off across the lake and the Canal Cuts and transit the Pedro Miguel and Miraflores Locks between 11am and 2pm. Don't forget the Miraflores webcam. Download or subscribe at my PodCastaway page. On Friday, I went through the Panama Canal as a 'Line Handler' with Tom and Nicolette on Katanne. We rafted up with two other boats and went through together. It was a great trip and I learned lots about practical aspects of the Canal transit. I now feel much more confident facing our own transit on February 28th. BTW there are some webcams on the site of ACP the Panama Canal Authority. link I'll post later a time range when we expect to be in the Miraflores Lock. I have just posted show 12 of my podcast. 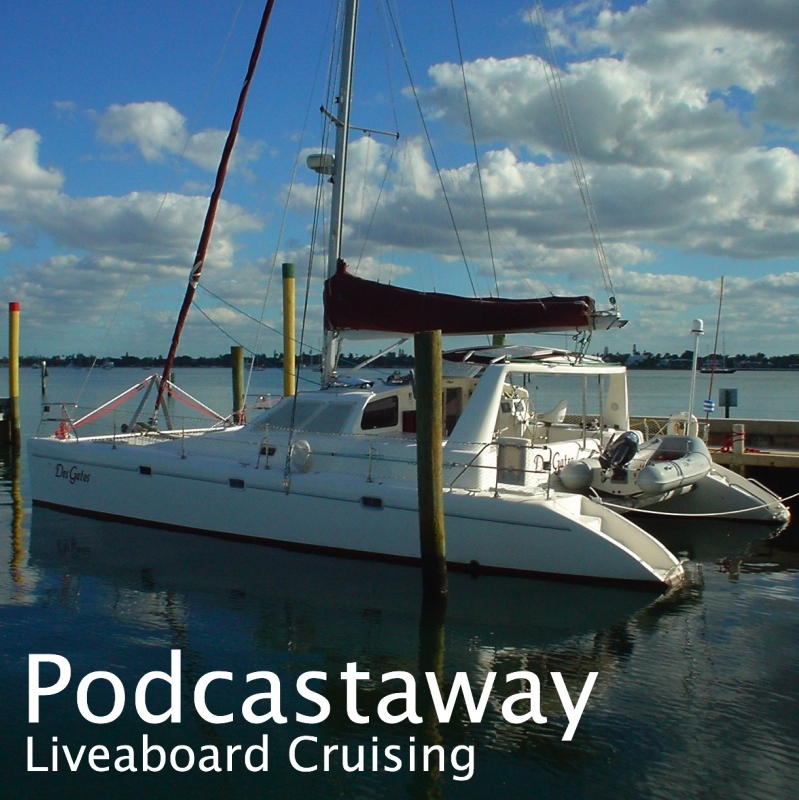 This episode was recorded during the four day passage from Aruba to the San Blas islands. It may be downloaded from my Podcast Page. We took 4 easy days to travel from San Blas to Colon. The first night we stopped at Bahia Escribanos. This is a large shallow mangrove-lined uninhabited bay about 15 miles from the San Blas. It's protected by reefs but the entry wasn't difficult. The second night we stopped at Isla Grande. This appeared to be a weekend destination with beaches, homes and small resorts. The third day we arrived at Portabelo, only 9 miles on from Isla Grande. We stayed here 2 nights. Portabelo has a long history. It was a key port in the shipping of Spanish gold to Europe. As a result it was attacked several times by the English and the Dutch and by Pirates. 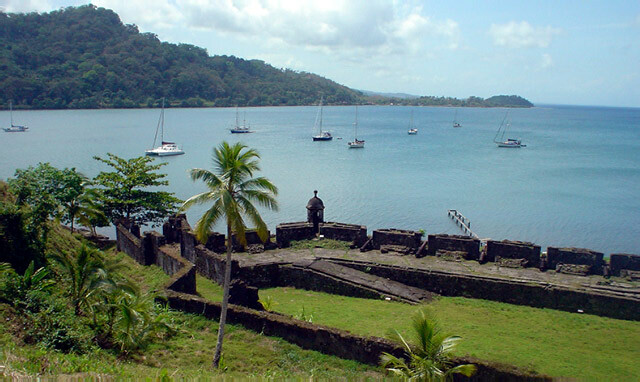 Sir Francis Drake came here and was reportedly buried at sea near the harbor mouth -- near Isla Drake. The town was heavily defended, there are four or five well-preserved forts around the town which we tramped around. We also did a dive near Isla Drake. Mr Gee is a Kuna who was educated in Salt Lake City by the Mormons. He retuned to Kuna Yala, bought a (very) small island in the East Lemons and started a business. 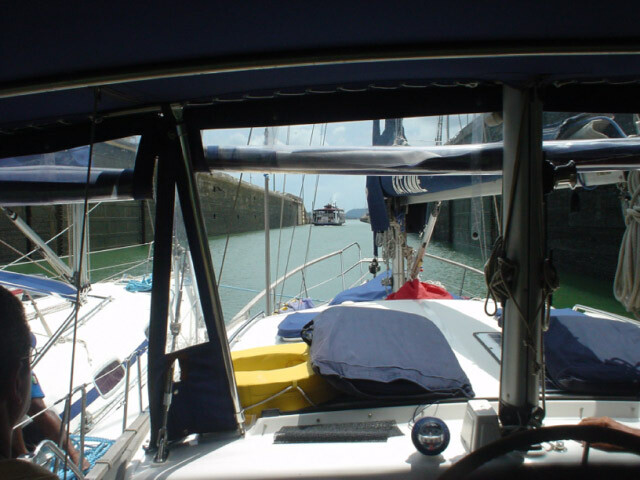 One evening we met three other boat crews ashore to drink Mr Gee's beer -- Lady Jane 3, Decourcey Spirit and Respite. While we were there, we bought some freshly baked bread. Mr Gee offered us dinner the next night - $5 for meal and 3 beers. We accepted and returned at 5pm next evening; dinner was quite early as Mr Gee has no lighting. He and his wife served us fish soup, rice, potato salad, cucumber and tomato. Plus beers of course. We ate on a bench outside his two huts surrounded by kids, dogs and a loud parrot. We had a great time and the food was pretty good. Mr Gee speaks excellent English and was a good host. We donated $5 each to a fund supporting the local school -- Mr Gee is the teacher. 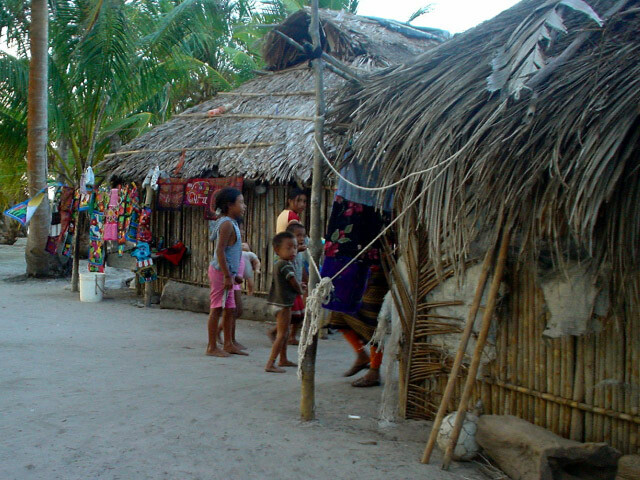 That was the closest we came to the Kuna during our stay in the San Blas, apart from many canoes selling embroidered molas, some selling fruitas or langusta, and one old chap who asked us to charge his cell phone. We spent 2 weeks in the San Blas Islands, first arriving at Isla El Porvenir after our 4 day passage from Aruba. It cost $110 to check in. That gave us a Cruising Permit, an internal Zarpe to Colon, and stamps in our passports. We also paid a fee to the local Kuna Indian administration. 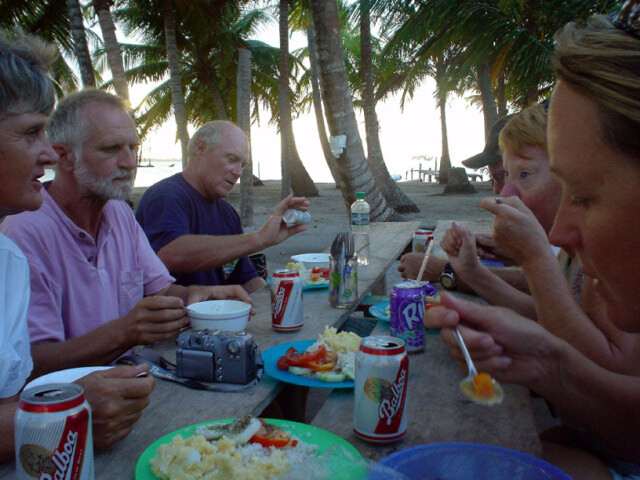 After check in we motored 15 miles to the East Herandes, an area called the Swimming Pool where we had heard we would find John and Barbara on Constance, whom we had not seen since Belize in 2004. We arrived in time for the weekly pot luck and trash burning party. After a couple of days we moved to a more secluded spot nearby and made a couple of dives. The San Blas has deep channels running close to its reefs and islands so it was relatively easy to find dive sites. The dives were good, but visibility was only average and there was some current. We later moved to the East Lemons and made two more dives there. We heard that diving was at one time banned in the area in some rules handed out at check in. We received no such list of rules and no one bothered us. I think that maybe they associated scuba diving with spear fishing - maybe they couldn't think of any other reason for someone scuba diving. The yachties certainly do a lot of spearfishing (free diving) - this is one of the few places it has been permitted. It's ironic that many places ban spear fishing but permit recreational diving. The Kuna had it the other way around.